This apparent Eastern Phoebe is clearly sitting on eggs. Her mate was nearby. As noted on the pics I took these with a long telephoto then cropped them to further enlarge them. I also took them from inside my car to reduce disturbance and stayed less than a minute. 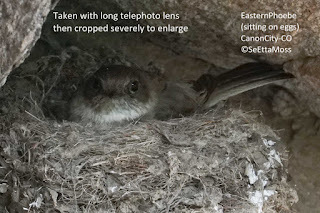 I comply with Nestwatch.comNest Photography Guidelines.